As winter approaches, I can’t help but feel a little sad to see my bright flowers of summer dying off; but with the right winter plant protection, I know that they will be back in the spring. The winter care of plants varies greatly by plant type, location, and climate. Several types of trees, shrubs, and perennials require a period of cold dormancy in order to live and thrive; established plants hardy in your zone need little to no care. Other plants, like annuals, container plants, tender perennials, tropicals, and non-hardy plants depend on your help to make it through the winter months. For plants that must stay outdoors during the cold months, plant protection begins at the time of selection. It is best to choose plants that are hardy in your climate zone or colder. The hardiness zone will be listed on the plant’s tag. I have to admit; sometimes I find a plant that I just can’t live without that is a zone or two away from being hardy in my area. Perhaps you have also fallen for the charms of a fragile plant. Don’t worry; there are many ways of protecting your delicate beauties. I have found that the first line of defense in winter plant protection in addition to selecting hardy plants is to keep plants healthy! After buying a plant, proper planting and care lead to a healthy resilient plant that will make it through the winter. Make sure to plant at the proper depth; usually there will be planting instructions on the tag. Plant trees, shrubs, and perennials that are not quite hardy in your zone close to your house or other structures to protect them from the wind. Plant in well-drained soil to prevent rot. Make sure to water deeply and consistently, as deep watering leads to a deep and extensive root system and a healthy plant; fertilizing consistently and at the right times give a plant nutrients and strength. Pruning in the spring and early summer encourages growth and gets rid of old and possibly disease harboring dead parts of the plant. Do not fertilize or prune in late summer or early fall, as it will cause a flush of growth when the plant should be preparing to die back for the winter. 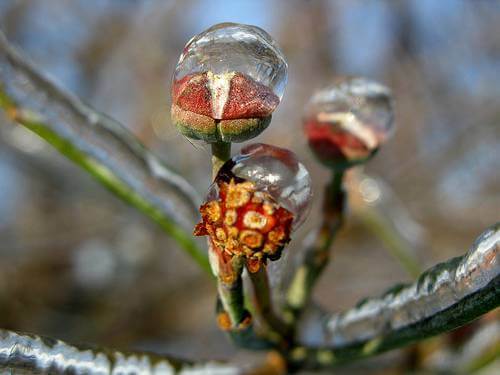 Do water deeply until the ground freezes, as moist soil holds more heat than dry. Although most people buy new annual bedding and container plants every year, I like to save particularly stunning and unusual annuals-it is easy to do. Simply move your annuals indoors to a sunny window. If you are short on space, you can take small cuttings of the plants and grow them in a jar of water on the windowsill or in a small pot until summer returns. They may get leggy, but they can be rejuvenated in the spring and summer. Similarly, tropical plants will need to be moved indoors to a sunny location as well. Some bulbs and corms like caladium, cannas, and elephant ears need to be dug up after the first frost and stored indoors in a basement or garage where temperatures are cool but not freezing. They should be packed loosely in sawdust or shredded paper and kept dry. Moisture will cause rot. You may want to allow tender perennials to overwinter in a basement or garage as well; some of these plants need a cold rest period, but not a freezing cold period. I have a lot of hardy perennials and even shrubs growing in containers; they have to stay outside for the winter and they require specific plant protection. The roots of potted plants are not insulated from the cold like the roots of plants in the ground. Only the thin wall of the pot protects them from the freezing temperatures. To prepare containers for the cold, sink the containers into the ground if you can, then mulch them. If this is not possible, wrap the pots with blankets or bubble wrap and group all of the containers together. Put the most delicate plants in the middle to further insulate them. If you can move the containers to a protected area against the south side of the house or near some other structure, that gives additional protection. Small containers can be put in a cold frame and packed with mulch or sand. The most popular method of plant freeze protection is mulching. I find mulching to be the easiest winter protection method. Mulching insulates plant roots and prevents the plants from heaving out of the soil; it is good for plants that have been planted late in the year, young plants, tender plants like strawberries, and plants that are not quite hardy in your area. Straw, pine needles, leaves, commercial mulches, soil, and wood chips are all types of mulch. Whatever you use should drain well-straw is one of the best mulches. Apply two to three inches of mulch all around the base of the plant, making sure to pull it way from the trunk or stem of the plant. Pests such as rodents may nest in the mulch and you don’t want them chewing the base of the plant, plus you don’t want moisture rotting the base either. For roses and plants in extremely cold areas, more mulching may be necessary. Do not mulch too early, as it increases the risk of critters making a home in the mulch. Usually November is a good time to do this. So, you have carefully selected your plant and take care of it over the summer. You have planted susceptible plants next to your home or other structures. What else can you do to give your plant freeze protection? For evergreen shrubs such as Rhododendrons that are susceptible to sun-scald and desiccation, you may want to build a windbreak by forming a fence out of wooden stakes and burlap around the plant. This protects from the wind and the sun. Windbreaks are good for any kind of plants that are exposed to damaging winds, and are generally constructed on the northwest side of the plants. Fragile shrubs and young trees can be protected by constructing a fence of chicken-wire around the plant and then stuffing it with leaves, straw, or mulch. 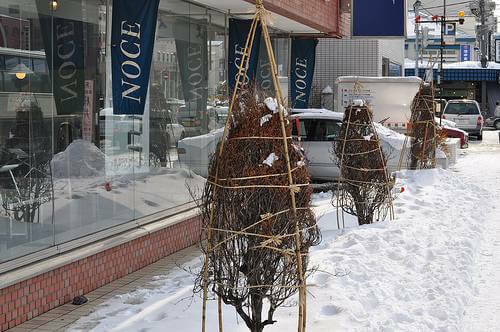 Sometimes tying the branches then wrapping the plant is a good idea to keep the wind from damaging branches or canes. Some gardeners protect tender roses with rose cones opened at the top and stuffed with leaves or mulch, creating a collar around the plant. Do this between frost and snowfall-if you do it too early, the warmth could cause the plant to break dormancy and kill it. Half-hardy plants like some climbing roses, fuchsias, some grapevines, and figs should be trenched, if possible. This is done by digging a 14-16 inch trench in the ground in which the plant and pot if potted can be placed in on its side in the trench. Then, the pot, stems and branches are covered loosely with soil or mulch and held in place with burlap and stones or other weighted objects for the winter. If the plant is in the ground and the canes or stems must be bent, do so very carefully as they are brittle in winter and can easily crack. Wrapping canes, branches, or stems in place and creating a collar is another option that doesn’t require bending the canes or stems; I prefer this method for plants already planted in the ground. Cold frames are small versions of unheated greenhouses and very elegant looking in my opinion and can be used to protect tender plants, bonsai plants, or potted plants in winter. They can also be used to lengthen the growing season of cool weather vegetables such as spinach and broccoli, or for plant frost protection in the spring. They can be bought or made, and can be as simple as 4 hay bales arranged around plants in a square shape with a “lid” of plexiglass or an old window. Traditionally, a cold frame has a wood frame topped with a glass window. The bottom is open allowing for plants to be planted in the ground. Sliding the lid on and off or opening the lid allows for ventilation. You have to keep an eye on cold frames to see when they need to be ventilated, and you need to check to see if they need to be watered. Row covers are made of many different fabrics, some of which allow moisture and light through them. They can be draped over hoops or frames and weighted down, or they can simply be put on top of plants. They are placed over mulched plants after the ground has frozen and plants are dormant. Row covers are also used to extend the growing season of plants. 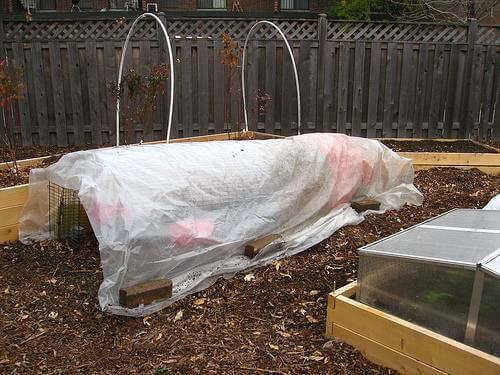 Image via Flickr by Linda N.
I have found that both cold frames and row covers have to be used very carefully. On warmer, sunnier winter days the temperatures inside the cold frames or row covers can heat up enough to allow plants to break dormancy; when the temperatures later drop, the plants can then be damaged and killed. Cold frames and row covers are perfect for setting out plants early in spring-they can be used for plant frost protection and snow protection in the spring until the weather warms sufficiently. They are also great for extending the growing season of cold weather crops into the winter.